During the past five years, the share of beauty and personal care products sold online in China has skyrocketed—increasing by nearly six times—to the point where 15% of the industry’s sales now occur online. That’s three times greater than in most other developed markets, an indication of just how lucrative the Chinese eCommerce market can be. Furthermore, Chinese consumers have shown a strong preference for imported luxury brands of beauty products. According to a KPMG survey of 10,000 consumers, a full 45% choose eCommerce sites as their leading choice for buying luxury items—with beauty products at the top of the list, followed by women’s shoes, bags and clothing. And whereas the Chinese online beauty market has traditionally featured extremely price-sensitive consumers, it’s now seeing a shift toward emphasis on product quality. According to recent reports by research company, Mintel, 63% of Chinese consumers rank quality as their top priority, while 38% say it is price. The shift is not altogether surprising, given the spending power of China’s growing middle class and ongoing concerns about the quality of Chinese products, particularly in the area of product safety. With the emphasis on quality, almost one in three consumers states they’ve paid full price online at least once. According to Thibault Villet, CEO of mei.com, the Chinese flash sale platform for luxury and fashion goods, “Low price is playing an increasingly smaller role in driving online sales. Still, even customers who are willing to pay the MSRP on beauty products will be buoyed by the Chinese government’s recent changes to the tax rules affecting foreign merchandise sent directly to consumers. While lower-priced products such as food are seeing price increases because of the tax changes, just the opposite holds true for higher-end purchases such as cosmetics. “Cosmetics will be the biggest beneficiary after the tax adjustment,” stated Catherine Tsang, a partner at PricewaterhouseCoopers LLP in Hong Kong. She notes that price reductions will further accelerate an already robust market. 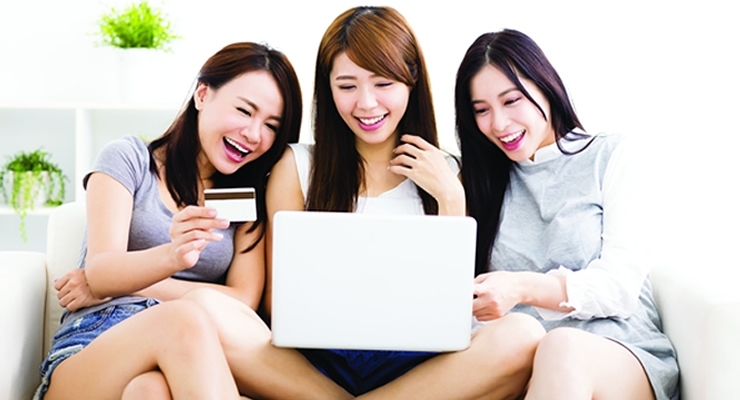 As one would expect, giant e-retail platforms such as Alibaba’s Tmall, JD.com and Yihaodian are leading venues for online beauty purchases. Sasa, a platform specializing in cosmetics, is also popular. One feature of Weibo is that opinion leaders and celebrities use it to share favorable opinions on their products of choice, which can go a long way toward building brand and generating sales. Product reviews from “ordinary” consumers also matter greatly. In China, when potential buyers are researching a purchase, they may tend to minimize the importance of star ratings or numbered reviews, given the abundance of fake reviews and the possibility that the review may be generated by a third-party on the payroll of a brand. Still, while rating scores may be viewed as unreliable, the actual content of the reviews—what is being said—tends to be carefully read. The purchase itself is often conducted via social on a mobile device. Consumers can browse for beauty products on Weibo and buy through a link directly in the app, or through WeChat, a rival social media tool in China. Quite simply, the link between social media and eCommerce is much tighter in China than in many other markets around the world. QR codes also play a significant role in the mobile beauty landscape. According to iResearch, 42% of China’s mobile internet users have used QR codes, and two thirds of beauty/personal care brands on Tmall enable QR codes for online shopping. That’s a sharp contrast to the U.S. and Europe, where QR codes have never really caught on. The top three countries generating import beauty purchases in China are South Korea, Japan and France. The demand for South Korean brands such as Innisfree, Lanéige, Etude House and The Face Shop can be traced in large part to the popularity of South Korean soap operas on Chinese TV, where Korean brands are showcased on the stars of the shows. Estée Lauder has also had considerable success in the Chinese market, with online sales growing by a whopping 80% year on year in the second quarter, with 13% of the company’s total sales in China now being generated online. Freda also stated that on Singles Day, which is held every November 11 and is China’s biggest online shopping day, sales of Estée Lauder and Clinique on Tmall more than doubled from the previous year. These sales figures have helped propel Estée Lauder to $1 billion in online sales worldwide. Alexis Perakis-Valat, CEO of L’Oréal China, attributed the frenzy, in part, to the explosive popularity of “selfies,” which prompts customers to make purchases that allow them to look “instantly good.” Again, it’s a case where mobile devices are at the center of the action. Of course, there have also been cases in which sales results were less than stellar for foreign brands. “China is a market with unique challenges requiring a different operational structure to that of developed markets,” stated Euromonitor International’s Oru Mohiuddin. It’s a market where competitive intelligence is vital, including a knowledge of what online competitors are doing, what SKUs they’re offering, how much they’re charging, and how they’re structuring special promotions. The need is especially pronounced when one considers the sheer size of the online Chinese opportunity, which accounted for sales of 3.877 trillion yuan ($589.61 billion) in all categories in 2015, an increase of 33.3% from a year earlier.